Beanybux.com Administration has canceled this contest until further notice. Beanybux.com game contest - Balls and Boxes is here for you! Any Beanybux.com member can participate for free. 2. Click Balls and Boxes to open the game in a new window. 3. Register with your Beanytalk.com username. 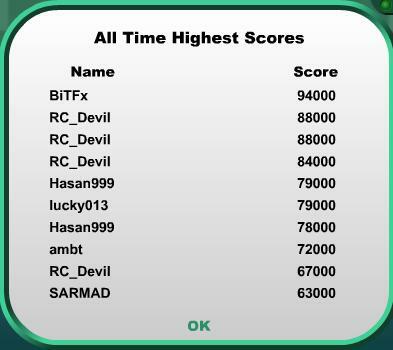 The TOP 1 high score will get the instant payout of your Beanybux.com balance. The contest HAS BEEN CANCELED AS OF OCTOBER 26TH, 2008. RC_Devil wrote: That is a really good idea. Now you're wrong, I'm not allowed to enter the contest. I thought you can enter in the contest. Because your score is there. When I get more time, I will do it better!! cant wait to get my hands on this 1 . Thanks funny for adding this Game Contest ! !...and its a cool game! You trying to advertise your blog? I don't see your High Score there. I see that I am at first place, is it a bug? Hi, if you follow the Rules, you won't have problems with game. First, you have to play the game using the link that Funny put in her site, you can find the game in other sites, but each site that use that game has its own hi score. If you are not logged in I guess your score won't be saved. I made like 126000 which I could also see in the Hi-score list... but now its not there !?!... instead, another score of 57000 with my name is shown which I think i didn't make that one. Even SARMAD's score of 106000 was there, but now I cant see that either! I don't see Sarmad's score and yours is 57000, yesterday I was playing and I didn't have any problem, are you sure you are using the link in the Funny's Blog? no 1 cn see my score i am at last three. SARMAD wrote: no 1 cn see my score i am at last three. I don't understand what you said (numbers, cut words), Can you write correctly? I don't think there's any bug, I tested the game myself. Remember you have to login and play the game through my blog link, otherwise your scores won't be recorded as we have independed high score tables for my blog.